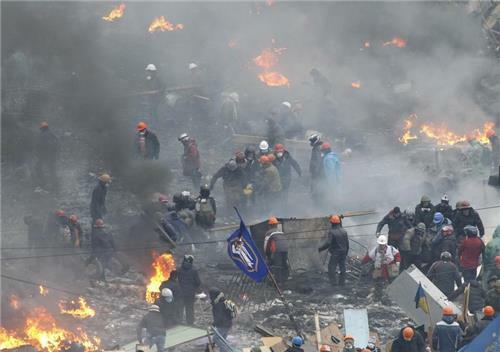 KIEV (Reuters) - Twenty-one bodies were lying on the ground covered by blankets on or near Kiev's Independence Square on Thursday, a Reuters photographer at the scene said. 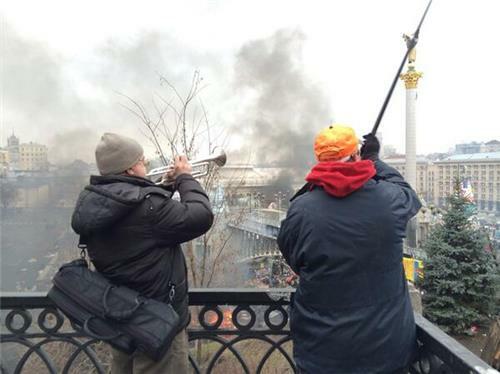 Photographer Vasily Fedosenko said he saw six bodies at the northwestern side of the square and then a few moments later saw a further four bodies about 100 metres away at the other side of the plaza. They were all civilians, he said. 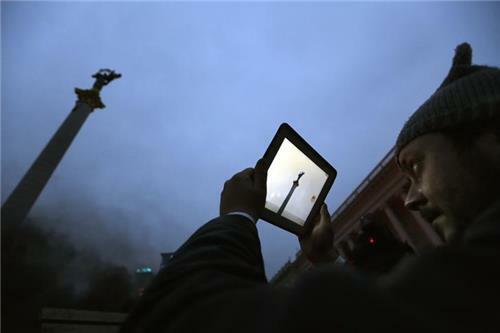 A short while later, he saw another five bodies in front of the hotel Ukraina, which stands on a hill and looks down on Independence Square. 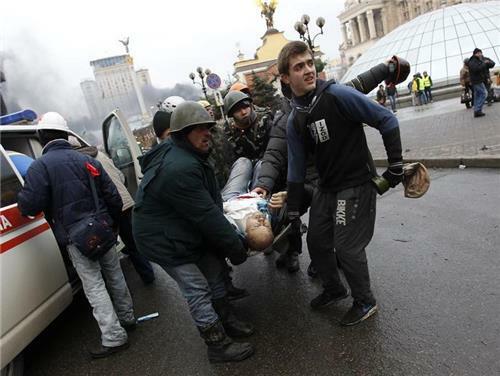 He later reported seeing six more bodies in different places near the square. 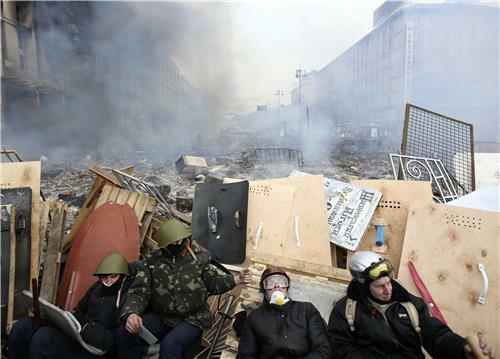 Local media and an opposition twitter account Euromaidan put the death toll among protesters at more than 30. Leaders must take politics off street-Strongly support convening VR session today-Only way out-negotiated pol reform, not more bloodshed. 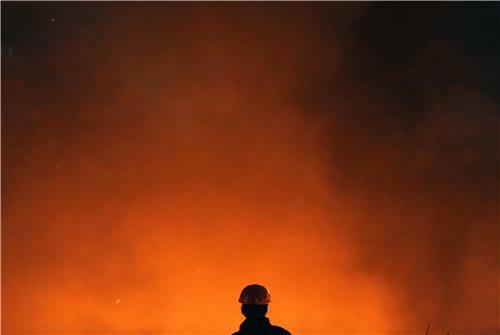 are EU sanctions likely to have any effect on the situation on the ground in Kiev? 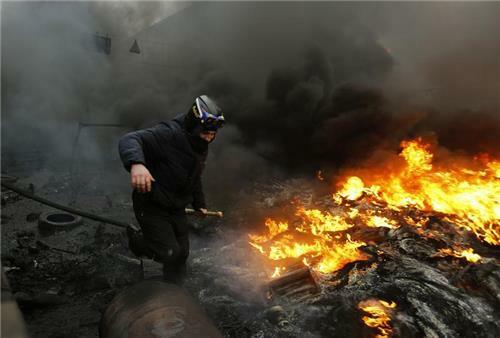 KIEV (Reuters) - Ukraine's presidency on Thursday blamed protesters for starting violence and using snipers which resulted in clashes with police which has led to at least 15 people being killed. 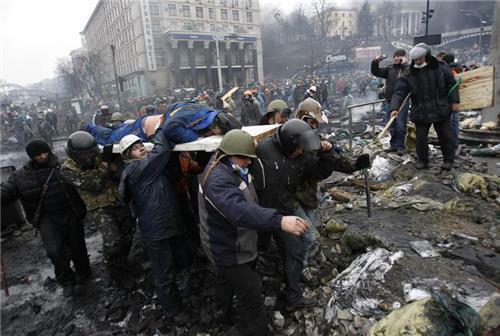 A statement from President Viktor Yanukovich's office said: "They (the protesters) went on to the offensive. They are working in organised groups. 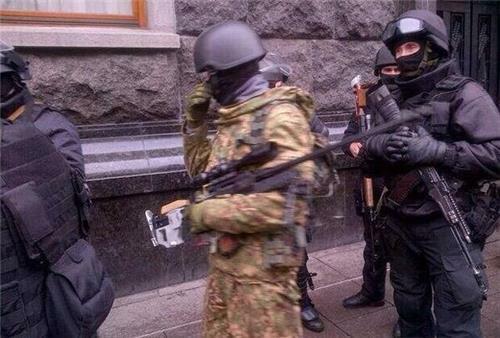 They are using firearms, including sniper rifles. They are shooting to kill. "The number of dead and injured among police officers is in dozens," the statement on the presidential website said. Are the goverment likely to implement a communications blackout? Blocking social media/mobile phone networks? 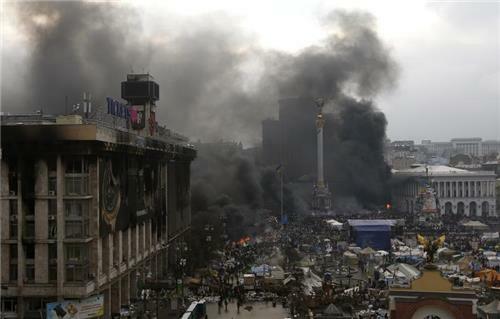 Truly alarming development in Kiev. We repeat our call for all to avoid violence and for regime to initiate truly honest political process. Volunteer doctor takes the microphone on Independence Square, talking about the people she has treated. Breaks down in tears - "Snipers are shooting us in the streets." Russian singer Ruslana now speaking on Independence Square. Holds up spent bullet cases and ammunition, asks people to be careful and help the injured. MOSCOW (Reuters) - Prime Minister Dmitry Medvedev said on Thursday Russia could only have fully-fledged bilateral relations with Ukraine when its legitimate leadership was in "good shape", Interfax news agency reported. "We will continue to cooperate with our Ukrainian partners in all areas, we will try to do everything to fulfil those promises which we gave. 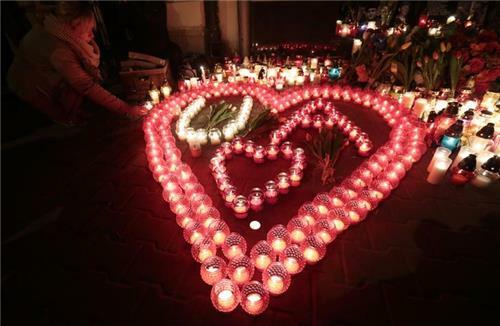 But at the same time for this to happen it is necessary for our partners themselves to be in good shape and for the authorities in Ukraine to be legitimate and effective," he was quoted as saying. From the stage on Independence Square a speaker begs police to surrender, promises amnesty and then urges protesters to fortify the barricades. If it were the protesters, radical or not, that have re-ignited the clashes after a truce was called, who will be held accountable? 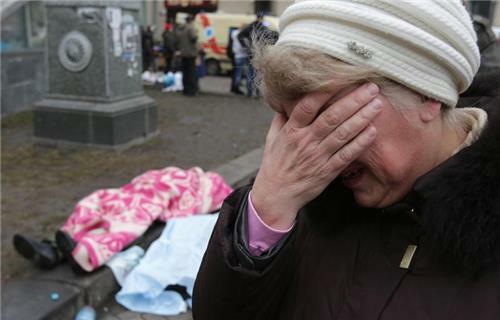 Will the western world put the same pressure as they have been puttin on Yanukovych? WARSAW (Reuters) - Fighting between police and opposition protesters near the presidential palace in the Ukrainian capital prevented a planned meeting between European envoys and President Viktor Yanukovich, Polish Foreign Minister Radoslaw Sikorski said. 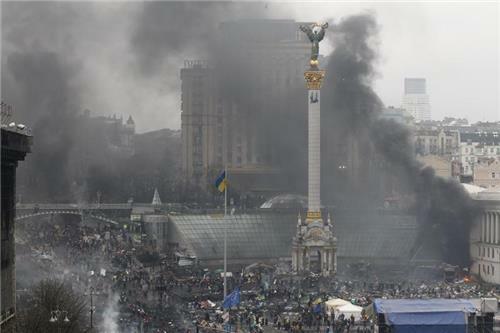 "Black smoke, denotations and gunfire around presidential palace. Meeting moved to another location. Officials panicky," Sikorski said in a post on Twitter. He had flown into Kiev along with counterparts from Germany and France. 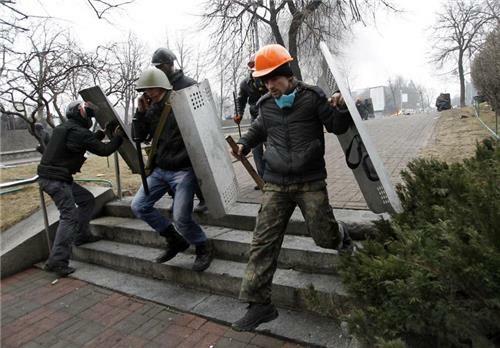 Social media reports up to 50 captured riot police being taken to the Ukrainian Energy Ministry building to receive medical treatment from volunteer protester medical service. Does the anti-government sentiment of these protestors represent the whole country or is this an Occupy style movement where a highly mobile and visible minority is being given a lot of media attention? Does the movement appear to be running out of steam? Does the regional parliament in Lviv have any forces behind it? Police? Security services? Does it have any means to enforce its declaration of executive power? No winners in civil war. TOLUCA, Mexico - U.S. President Barack Obama and Canadian Prime Minister Stephen Harper reacted cautiously to a truce between the Ukrainian government and opposition leaders, saying it would be a welcome step if implemented. 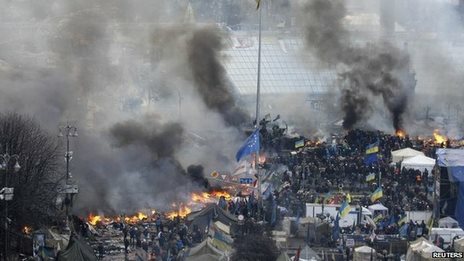 A White House statement describing face-to-face talks between Obama and Harper at a North American summit said the two leaders condemned violence in Kiev in which at least 26 people were killed. "The leaders noted reports of a truce between the government and the opposition which, if implemented, would be a welcome step forward in pursuing that meaningful dialogue. They agreed they will continue to monitor the situation closely to ensure that actions mirror words," the statement said. They also urged the Ukrainian military to show restraint and not become involved in issues that should be resolved by civilians, the statement said.